Description: All four species are small bushy evergreen trees with short trunk, horizontal branching and rounded crowns. Found in semi-arid regions of the west. Sometimes called Mexican Nut Pine, it is native to both Arizona and New Mexico, where the seeds are harvested and sold as nuts. Once a staple food of southwestern Indians, Pinon ranks first among the native nut trees of the United States that are not also cultivated. In autumn pine nuts are harvested by local residents for local and gourmet markets. It occurs in mixed or pure stands of woodland in foothills, mesas or canyons, & often on dry, rocky ridges. It does well in cultivation, a wide variety of soil and moisture conditions, is winter-hardy, slow-growing, and very long-lived. Needles: are 1 to 1/2 inches long, and grow singly on Singleleaf Pinon, in pairs on Pinon and Mexican Pinon, in fours on the Parry Pinon. 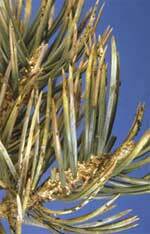 Needles have smooth margins, except for Mexican Pinon which has finely toothed edges. Fruit: Large edible seeds; reddish to yellow-brown, oval to globular, 1-3 inches long, scales thick, resinous, seed diversely shaped, 1/2 to 1 3/4 inches long, oily, brown to black. Elevation: Elevation: 4000 to 9000 feet. Water Requirements: 12 inches precipitation equivalent, drought-tolerant, will not tolerate high water table. Once established, requires no additional water. Soils: Dry, rocky, gravelly soils. Adapted to a wide range of soils and moisture conditions. Uses: Windbreaks, food and cover for man, wildlife food and habitat, especially for squirrels, pinyon jays, bears, & deer. 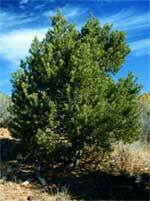 Pinon pine is suitable for ornamental and recreational plantings. It is useful as a screening element, especially beautiful and ornamental in landscaping.